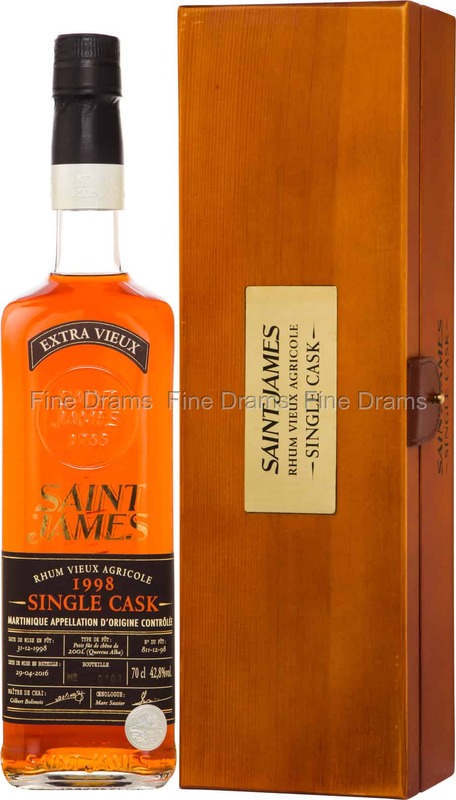 A simply magnificent single cask offering from Martinique distillery Saint James. An extremely well aged Rhum Agricole, this bottling was distilled 31st of December 1998 and bottled on 29th of April 2016, having rested for 17 years in an American oak cask. 17 years is an extraordinary age for rum matured in the heat and climate of Martinique, meaning that this rum has developed a staggering depth of flavour. This spirit serves up notes of deep oak and cigar box, followed by a glissando of pineapple, lime rind, mango, wood spice, dried fruit, chocolate, coffee, cream, butterscotch, bananas and walnut flavours. The finish is long and lingering, with a warming spice. A truly delectable rum, which is bottled at 42.8% ABV for a boost in intensity and mouthfeel. Each bottle comes with a smart wooden presentation box, with gold accents.